Home » Incometax » How to Link Aadhaar with PAN for Income Tax E-filing? If you have not Link Aadhaar with PAN on income tax portal you should do it now. As per latest circular from income tax department, it is now mandatory to quote Aadhaar for PAN Applications & Filing Return of Income. This rule shall be applicable from 1st July, 2017. The prime purpose of the exercise of linking Aadhaar with PAN is to fight against tax evaders who holds multiple PAN card for evading tax. 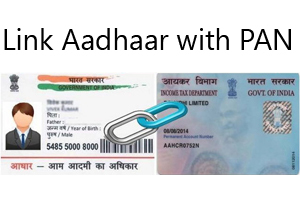 In this post, we will take a look at the process of Linking Aadhaar with PAN for Income Tax E-filing. In addition to that, I will explain about steps to be taken in case PAN detail does not match with Aadhaar details. The step by step process for linking Aaadhar with PAN card on e-filing portal is given below. When linking your PAN with your Aadhaar card, make sure that name, date of birth and gender displayed on the income tax website matches with the detail on your Aadhaar Card. Case -1 – Aadhaar Detail matches with PAN card detail. The first step towards linking Aadhaar with PAN is to register on Income tax e-filing portal. If you are already registered user on e-filing portal, Login to e-filing portal of Income tax department by entering your PAN as User Id, date of birth and password. On logging in to site, a pop up window will appear prompting you to link your PAN Card with Aadhaar card. You can input your Aadhaar number enter captcha code and click on LINK NOW. In case you have decided to link Aadhaar with PAN later click on LATER button. Enter your Aadhaar number enter captcha code and click on Link Aadhaar. Case -2 – Aadhaar Detail does not match with PAN card database. In case your Aadhaar detail Name, Date of Birth or Gender does not match with PAN card database system will display message “Authentication Failed”. In this case you have to send request either for PAN card detail modification or Aadhaar detail modification. 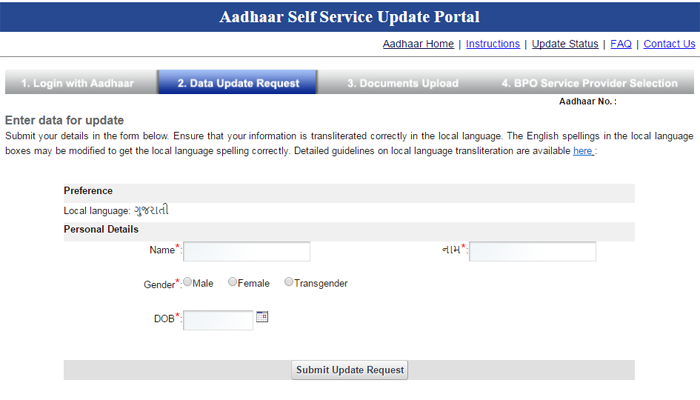 There are two ways to modify Aaadhaar Information. Enter your Aadhaar number, text verification code and click on Send OTP. You will receive OTP on your register mobile number. Login to portal by entering OTP. System will prompt you to upload document. You can upload your passport copy as a proof. Once you submit this correction request form you will get SMS mentioning request number for modification. Once data is modified you can link your Aadhaar with PAN card as per process specified above. Submit update/correction request by offline via Post. The second option for the data update/correction is offline method where you need to fill up Aadhaar Data Update / Correction from. You can download this form from UIDAI website. After filling up form you need to send this form along with Xerox copy as a validation proof to UIDAI office. Visit NSDL site for Online PAN application. Click on application type changes or correction in existing PAN Data. Provide complete information in form specified and click on submit button. Once application is submitted you need to pay fee for the modification of PAN. The fees for processing PAN is Rs. 107. Post this form along with valid document to NSDL office for PAN card modification. Once your PAN card is modified and new PAN card is issued you can link your Aadhaar with PAN card as per process specified above. I hope information given above will help you in linking your Aadhaar with PAN. In PAN data base my name has to be entered as Arul S selvan – only then it is accepting. You need to make same name for Aadhar card and PAN card, otherwise it will not allow you to link PAN with Aadhaar.